A couple of weeks ago, Econet introduced the dream data bundles, an off-peak mobile data package that offers 300 MB for $1. This was the most generous broadband offer to come from the mobile operator, even though some subscribers weren’t thrilled by the 12 am to 5 am access window. As if in response to that, Econet has followed up the dream data bundles with the Daily Data Bundles. This package(to be activated tonight) offers the same internet access privilege that you’d get with the dream bundles (ie unlimited surfing, browsing, downloading on any platform). The daily bundle is valid for 24 hours so even if you buy it at 11:45 pm it will only expire at 11:45 pm the following day. These bundles are a promotion that will last until the 20th of September 2015. To access the bundles, users will have to dial *143# select Option 1 – Purchase Special Bundle then select option 4 -Daily Bundle. There are two daily data bundles; one for 50 cents which will get you 50 MB and the $1 bundle that gets you 250 MB. Currently $1 gets you 10MB on an ordinary data bundle. In terms of local mobile broadband prices, this offer, along with the Dream Data Bundles package becomes the cheapest on the market, a position that we haven’t normally associated with Econet. The operator did after all point out that its competitive angle isn’t price but the quality of service. According to Econet, all of this is the positive effect that came from the introduction of a fair usage policy on its Social Media Bundles. 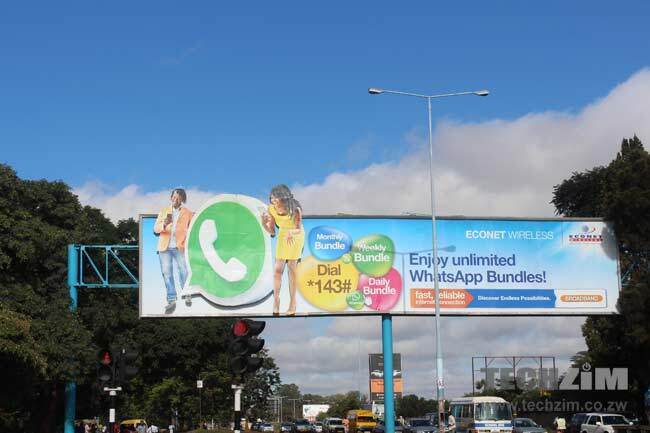 When Econet introduced the Lite and Extra variants for its Facebook, WhatsApp and Opera Mini bundles it also made an explicit reference to the throttling of data according to usage patterns. After the successful implementation of the fair usage policy, we have created capacity on the network and we are pleased to give this back to our customers. The network resources that were being enjoyed by a few of our subscribers can now be enjoyed by the vast majority of our customers. This allowed us to give customers a dream bundle which is usable off peak. As a follow up to this, we are now introducing the daily data bundle. We are working on more offerings, out soon. All this makes a lot of sense, and it’s easy to take it as the only reason for this change, but the way alternatives for mobile broadband have popped up recently in the form of competitively priced WiFi also can’t be written off. If you believe in bar talk theories on corporate image management it’s easy to look at this like Econet’s plan to clean up its relationship with its subscribers after it stirred up a hornet’s nest with the social media bundles price adjustment. When all has been said and done I can’t see why subscribers would care anyway. Mobile broadband just got a lot cheaper, something that is a win, no matter what the motivation. Econet should put a reasonable time limit or else go hang! If you read Nigel’s response below you will realise that this was an edit after i had pointed this out. So please just chill out and relax with a glass of maheu…don’t try to be a troll. Thank you! Sorry for that omission @Gedza, we’ve updated the article and included that info. I would appreciate if Econet could extend the validity period to at least 72 hours. My daily data consumption needs is for stuff like checking email, updating Twitter, facebook, a few updates, browsing and my average data consumption rate per day is way below 50Mb. You cannot use the word cheap and Econet in the same sentence. The move seeks to improve the average spent on data by a customer to $7 provided one requires internet access daily. Why dont they increase the expiry period as well. I have to agree with gabie on this one. No network most times. 250mb needs constant network. Should have tried the 50 cent option before opting for the $1.money down the drain. Out of it. It seems to be rather slow and maybe its being throttled. Definitely slow compared to the dream bundle. Wish I had not bought 2$ worth without trying it first! I bought the bundle & connected my PC to my phone and it was failing to open even a single page. Why am i failing to install your econet opera mini browser on my windows phone. I lyk the above comment by Wellaz, and i quote “You cannot use the word cheap and Econet in the same sentence”. But as much as u hate econet, this bindle is the cheapest in the market..excelent data speed and no throttling. wat more cld u ask for.